When a datasheet states the disc is "mounted in a concrete post" , generally speaking how much bigger is the top of the post than the disc? There are several markers near me that were mounted that way in the 1930's ( usually along railroad tracks) and haven't been recovered since. Unfortunately, many of the location descriptions that were entered at the time the marker was set are also of limited use (distance from a railroad code line pole - which most railroads have removed years ago, or distance from one of the rail heads when the track can be shifted a bit when new ballast is put in, etc.). In other words if the post is only an inch or so larger than the disc - with nothing else to work with, its going to take a "golden bb shot" with a soil probe to find it! I'm hoping that those older marks are like the one in the attached photo that was placed in 1947 where there's at least a fighting chance with the concrete around it. There are poured-in-place bench mark posts, which around here usually had the top formed to about a foot square, and mostly done in 1934. By 1935 many were precast and maybe 6 inches square at the top. 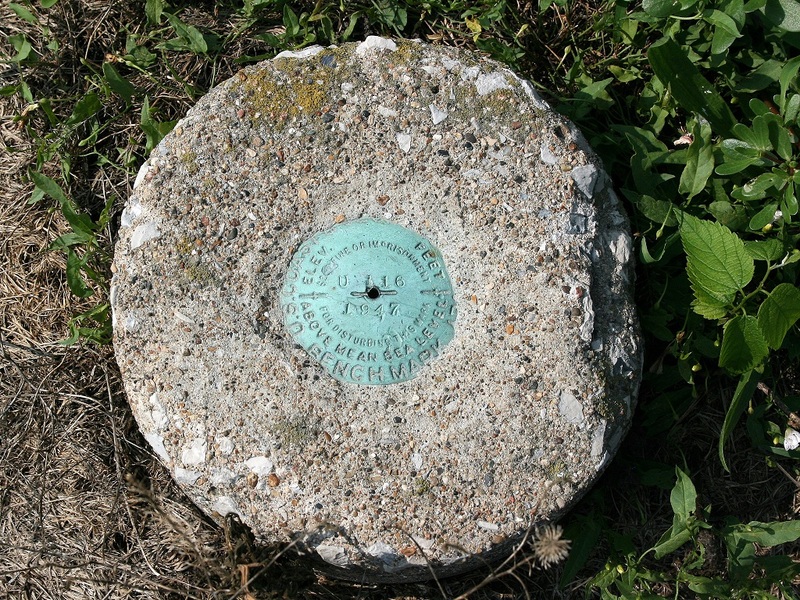 Triangulation stations typically were poured, round, and at least a foot diameter. You may find exceptions, but a given level run probably had all its posts made the same way, so compare others in the same run. A treasure-finder type of metal detector is a valuable tool to tell you where to probe. Ferrous/non-ferrous discrimination is almost necessary around railroads due to the proliferation of discarded hardware and sometimes iron-bearing slag used for ballast. Railroads are *private* property, and very dangerous. At worst, you can get killed. If caught, you will get ticketed or fined or locked up. Metal detector comments apply to abandoned railroads that have been turned into trails, also. I understand, I lived next to an active rail line for 17 years and my older brother was a track inspector for 10. If the disks are in concrete posts by a railroad, chances are they are well off the right of way, so you should be okay (safety wise. You may still be on railroad property). All the 1930s and 1940s bench marks (elevation) that I have searched for are in the precast posts, which are about 6 inches square, like Bill93 said. I started benchmarking with just a probe and had decent luck. I added a very check metal detector that helped immensely very quickly though. A note about the rails--most of the time they can't move rails much to the side because of clearances, so they should still be very close to the original measurement. Fractional mileposts and other removed things are another issue. I have often found the bases of telegraph poles, which has helped, and if you find references to rail lengths, 36 feet is pretty standard for mid-century rail length (it fit on a flat car). If you provide some more information (PIDs, etc) we may be able to give some guidance. My experience is similar to mloser's. If a post was placed at a road/railroad crossing it is nearly always far enough from the rail that you won't get hit by a train, and occasionally posts were added near the fence where there wasn't a road. Around here we have such a rectangular grid of roads and enough bridges and culverts that it usually wasn't necessary to set a post between roads. But the majority along a rail line are at the bridges and culverts only a few feet from the rail. If it's windy and no reason for them to whistle nearby, you might not hear the train until it is right there. And even if quiet and the inspection truck sneaks up on you, it could mean trouble. If I can see those marks in a quick look they can get reported, but I won't be digging dirt and ballast at a bridge on an active line or doing a GPS session that close. I thought 39 ft was the most common length for jointed rail. You can't be certain the joints are where they were in 1935, but if it gives "rails from the crossing" or from a signal the distance can help. Most of the major lines have since gone to welded rail which provides you no measurement. When we rode the train from Chicago to Arizona I'd gotten used to the feel of the train with some sway but not a lot of clickity-clack and then we hit the middle of Kansas where apparently jointed rail remains. Quite a difference in ride and noise. Distance from the nearest rail or center of the rails is a good indication, usually within a foot or two unless the line was re-done to add a set of tracks. If using height relative to the track, remember that many rail lines have been built up by added ballast, sometimes a foot or two since the bench marks were put in. The most common distance measure in old descriptions along railroads is "poles" which was a count of telegraph poles. If you can find some evidence of poles remaining anywhere in the area you can estimate the spacing along that line. Many were 40 to the mile (132 ft) but maybe longer and certainly shorter (e.g., 44/mile) in some areas. But extra poles could have been added especially around signals, stations, or rivers. There is a recreation trail near here that still has many poles standing at 132 ft spacing. Sometimes distances are relative to the mile posts. If you are lucky they haven't moved significantly, but when mergers happen the mile numbering sometimes is re-done. If you can get acquainted with a railfan (otherwise known to the crews as a FRN) in your area they might be able to show you old collectable track charts with the mile numbering on culverts and bridges closer to the date of the bench marks, which is a great guide but not necessarily to high precision. HistoricAerials.com is another great resource for figuring out where road crossing and former track lines used to be. There is one mark I reported as NF because it wasn't visible and I wasn't going to dig that close to the tracks. But looking at the old aerials I now think it likely the scaled coordinates at an existing crossing were a half mile off and the named whistle stop and mark were at a former crossing that is no longer there. That would depend on someone misreading a handwritten 4.7 miles as 4.2 miles, which seems conceivable. So gather your data, history sources, and evaluate the situation. Thanks everyone for the additional input! Here's a little additional detail. The image is a screen grab from the Data Explorer with the markers in question. This is in Northwest Ohio (Henry County) and the PID#'s are (from Left to Right) MD0156, MD0157, MD0158, MD0159 & MD0160. When the markers were placed (1934 for MD0156,MD0158 & MD0160 & 1963 for MD0157 & MD0159) the adjacent rail line was a Wabash RR secondary line that ran from Fort Wayne to Toledo. (Today it's the Napoleon, Defiance & Western RR Where things start to get interesting is that the original mileposts referenced (wood with mileage to Toledo on one side, Mileage to St. Louis on the other) were replaced some time after last recovery in 1963, for those placed in 1934 and after the others were placed. What I don't know yet is if they were simply replaced, or if there was any "adjustment" to get rid of "short miles". (I didn't have my GPS with me the day I went poking around to try to find them). Add to it that it has been 55 years and the rail line and adjacent property wasn't maintained the best (this you tube video shows some of the route where these markers are) so it's got it's challenges. The good news is that the soil is a sandy mix, so it's not too bad pushing a probe in, but I don't know how well a metal detector would work. Further advice on railroad directions: When the crew wrote the descriptions they usually assumed some overall direction for the railroad and did NOT use a compass. MD0157 has HH1 coordinates, which means somebody found it much more recently but did not submit a recovery to NGS. I checked the OPUS Share list and find that the Ohio DOT submitted GPS measurements on it. The cm-level GPS data automatically gets put on the data sheet as HH1 quality, since it isn't quite up to full standards for full 5-digit coordinates. This one should be a slam dunk to find. MD0158 has a 2006 GC log saying the milepost is there but they couldn't find the disk. Could be the metal detector is needed, if the weeds and brush aren't too thick to swing it. It's a little unusual that his coordinates are east of the data sheet values. When using the data sheet SCALED coordinates remember that when they took them off the map they TRUNCATED so if the mark on the map was perfect the location is within about 100 ft north and west of those coordinates. But if the mark was made by measuring miles from a station, it could have been somewhat less than perfect itself, as noted for one of the other mileposts along here. MD0159 has HH2 coordinates taken from a GC log in 2006. GE doesn't show any obvious changes between the road and RR, so I'd say the finding chances are good. MD0160 was reported on GC in 2006 as probably destroyed, as they found what looked like part of the post and no disk. Note that they mentioned the milepost, so that is encouraging for the others. off the right of way, so you should be okay (safety wise. You may still be on railroad property). There is no difference, all railroad property is right of way and the same goes for highways. You have no idea what other dangers are there, gas lines for instance, buried cables. I worked 30 yrs for the DOT as a Survey Technician and even for us to go upon RR property, we were required to notify the RR dispatch and get the OK. With today's nature of things most RR's have patrols out ahead of the trains and if they see you, they will not hesitate to call authorities and they don't give warnings, its a federal statute. You might not think a buried cable can't get you in trouble? I know a surveyor for local county highway dept who would tell you otherwise. They were doing some road once along county road. All the utilities were supposed to be located and marked. An piece of equipment accident hit a cable and within minutes police from the nearby Air Force (SAC) descended upon them in full force. He said there is nothing like having a boot in the middle of your back and M16 pointed to the back of your head with your face on the ground. Someone messed with the marking so as to cause problems, they cut the major communication cable to the base which was a top secret location. Nevertheless it took the better part of the day before they were released from custody once the USAF police were confident they were not sabatouers, the USAF police take the job extremely serious and so does the RR.